In a recent parent-teacher conference, I heard my colleagues speak of a student’s performance during the Anon(ymous) fall play. Other teachers in the room had seen her acting and threaded it to her writing in English class. We admired the flexibility of her creative processes and her sensitivity in the arts; we asked her about the balance of her academic learning, her service work at church, her long days at school as a result of rehearsals, and her responsibilities at home. She gave us a good sense of when sleep was cut slightly short and we brainstormed some ideas that might expedite her reading, organize her time and facilitate her laboratory work. Parents and faculty members left the room with a richer sense of what she needs, who she is, who she is aspiring to be. The advisor is now tracking how she feels about the upcoming musical and the connection she’s developed with the counselor as supportive help. This student is known. She is doing well as she faces the common challenges of teenage life. There are at least ten adults who understand her trajectory and are directly supporting her at school. At conferences and in our daily practice, we see a whole child’s learning and growth–we hear about kids’ character development in the soccer field; we learn about inventions being tried for InvenTeam; we get to watch the film production that happens in the evenings and weekends, for fun and for art class. Advisors care to hear about young adults riding the bus home, about students supervising siblings, about strategies that parents try to foster independence. We suggest behaviors to make self-regulation more facile and we involve everyone who is connected to a kids’ growth in the conversation. We know our students in order to respond actively to their individual development. And we attend to the whole community’s education in programmatic ways too. Over the last three years, we have trained senior mentors to support ninth graders through WINGS. The older students offer guidance in the realm of academics, social integration, and in traversing adolescence at school. The seniors have an adult mentor themselves who is an expert in counseling, leadership and human development. Another set of adult mentors are training students who have the power of influence amongst peers to identify and interrupt behaviors that can be hurtful. We acknowledge the social realities that our students navigate on campus, on line and in the larger world. We work to educate them to help each other be ethical, responsive and responsible toward each other. 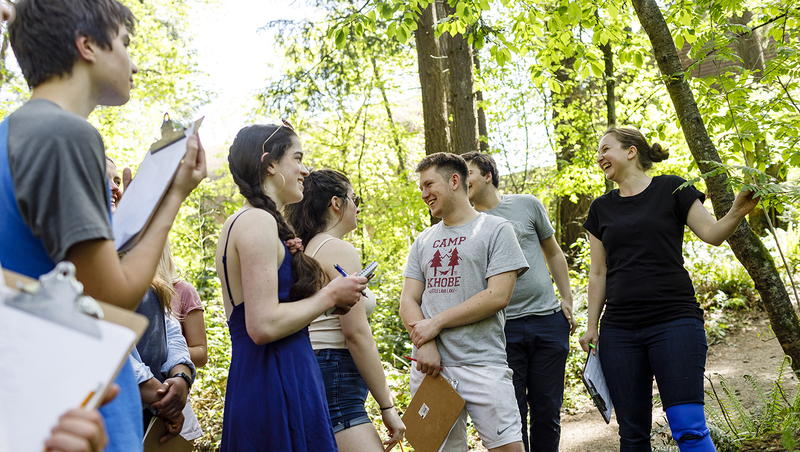 Our upper school faculty recognizes that student growth occurs through the aggregate of small experiences that happen in classrooms, the quad, locker room, parties and trips—close and far away. We deliberately attend to daily interactions as well as the systems that structure those experiences. True to our mission, we view each child as a whole as they slowly become adults.